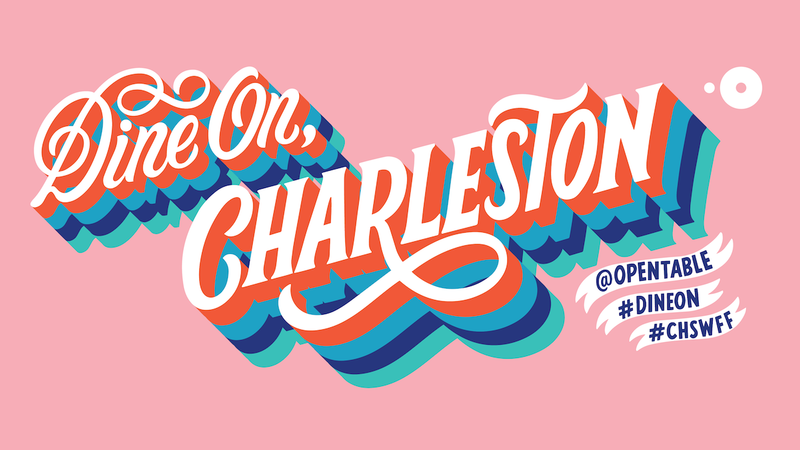 Are you headed to the Charleston Wine + Food Festival? Stop by to see us (and our mural) and show us how you #DineOn by sharing a picture of you in front of our mural — you could win a $250 Visa gift card! • Be sure to follow @OpenTable so we can notify you. Happy dining! Full terms and conditions after the jump. And, don’t miss our tips on how to food festival like a pro. 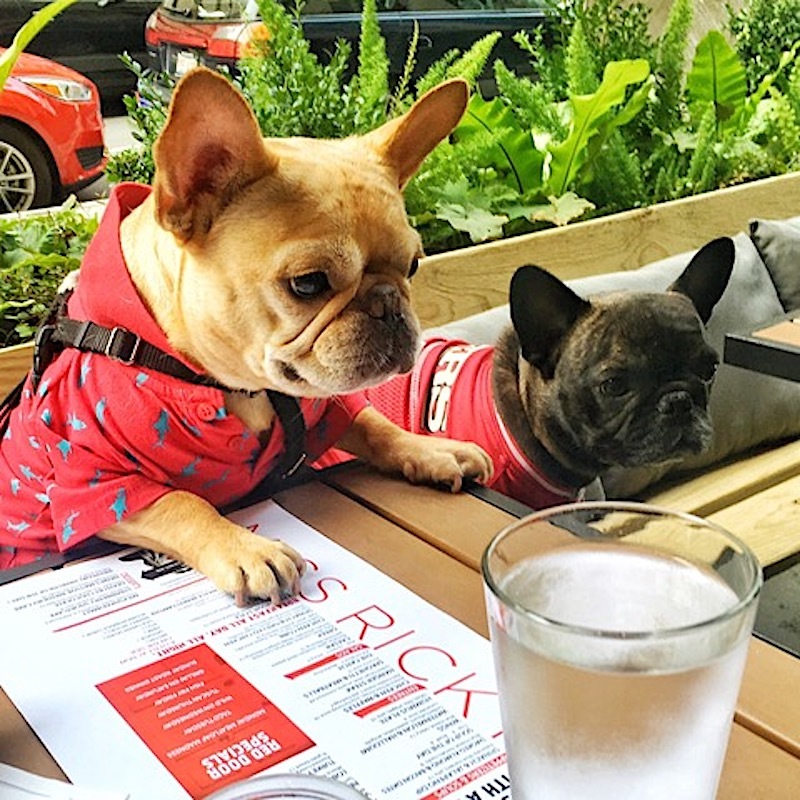 As more cities and states have passed regulations making it legal for guests who love dining with dogs to do so, and in honor of National Dog Week and the start of Adopt-a-Shelter-Pet Month in October, we’re highlighting some of the most dog-friendly restaurants around the nation. If you dine out with your dog, let us know your top spots for eating out with Spot. And, don’t forget to share your favorite #DiningWithDogs photos and restaurant recommendations with us over on Instagram for a chance to win a $100 Visa gift card and swag for your pup from our friends at Bark. Executive chef Fernando Darin makes his own two fur babies gourmet dog dinner every night when he gets home. This act of love inspired him to bring this home-cooked deliciousness to other furry friends with the recently launched Barky Brunch at the almost-impossibly stylish Ray’s and Stark bar, located at the Los Angeles County Museum of Art (aka LACMA), where you’re invited to sit, stay and eat! Dogs are welcome on the patio and can order from the “Man’s Best Friend” menu. Available every Sunday from 10AM-3PM, the dishes include Pizza Crust, Steamed Chicken & Broccoli Bowl, Watermelon Sorbet, Chicken Liver & Brown Rice Cookies, and a Pupsicle Treat. Humans can choose from brunch standards and spins, such as the Soft Scrambled Egg Tartine, Harry’s Berries and Fennel Salad, and wood-fired pizzas. Make a reservation at Ray’s and Stark. The name may mean café black cat, but they’re all about dogs at this Upper East Side restaurant in a Louis Candela-designed, landmarked townhouse that’s just a stone’s throw from Central Park, which hosts so many dogs on a daily basis you’d think it would be called Central Bark. Owner Susan Latapie says, “It’s simple; I love animals! 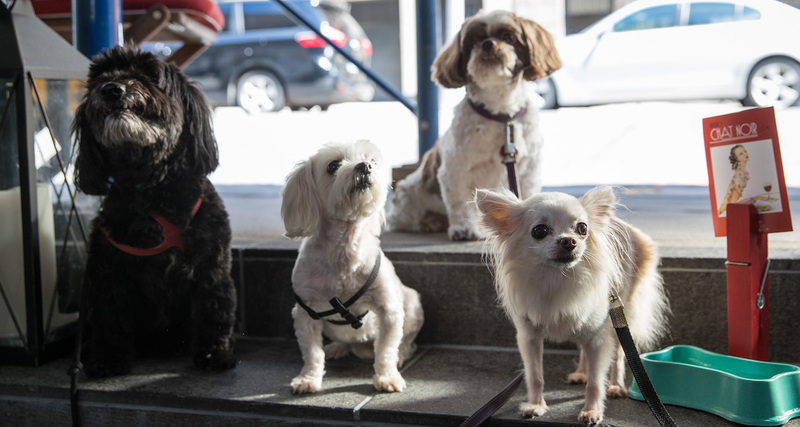 We’ve been a neighborhood go-to for over a decade now and, being just a block away from Central Park, we are in a great location to accommodate our furry friends. I also spent a lot of time traveling through Europe and noticed diners bringing their dog to dinner; a tradition for many. I wanted to recreate that sentiment at Bistro Chat Noir.” The restaurant specializes in fine seasonal fare and has a lush outdoor patio setting where dogs and their owners can create their own garden party. 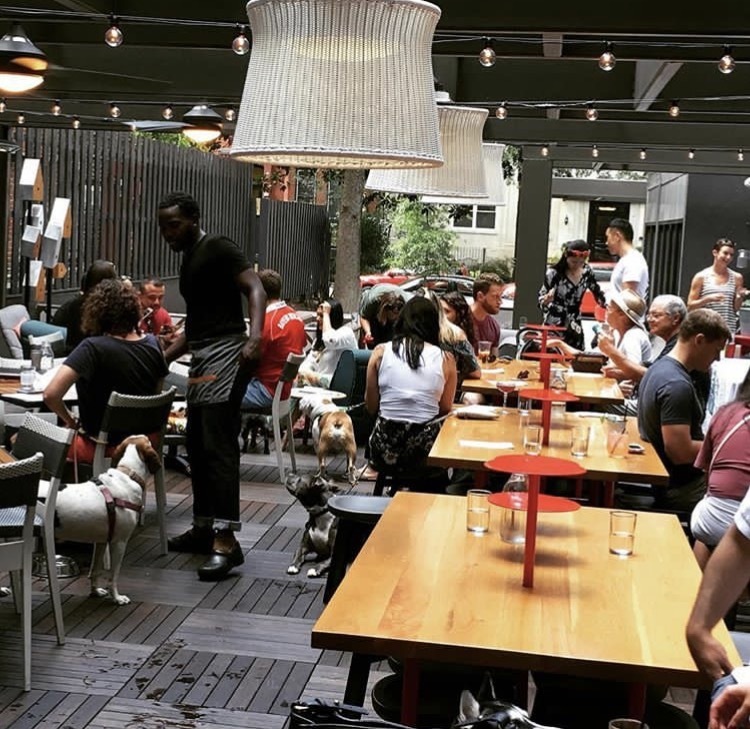 Consistently recognized as one of the city’s most dog-friendly restaurants, the eatery has an array of treats and toys on hand to keep pups engaged – and an endless amount of fresh water so Fido can get his drank on. If you and your pet want to dine in the park, grab a gourmet picnic basket to-go (they’ll include a dog treat if you give them a heads up). Make a reservation at Bistro Chat Noir. 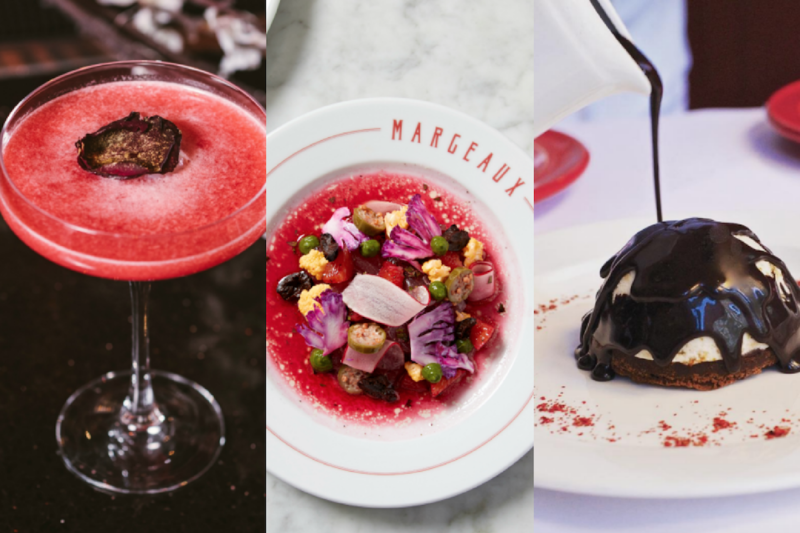 Virgin Hotels Chicago offers ample opportunities for furry friends to enjoy a luxe experience both in-room and while dining at their ground-floor, landmark diner, Miss Ricky’s. Pets are always welcome at the restaurant’s scenic patio so they can share in on the fun with their human companion. Don’t miss the weekly Yappy Hour on Wednesdays at Miss Ricky’s. You get a complimentary cocktail, while your dog gets a special treat on the house. Everything is made with a side of sass here, including the Miss Ricky burger which is, “Just like mom used to make if mom were a cross-dressing foodie with a full sleeve tattoo.” Make a reservation at Miss Ricky’s. 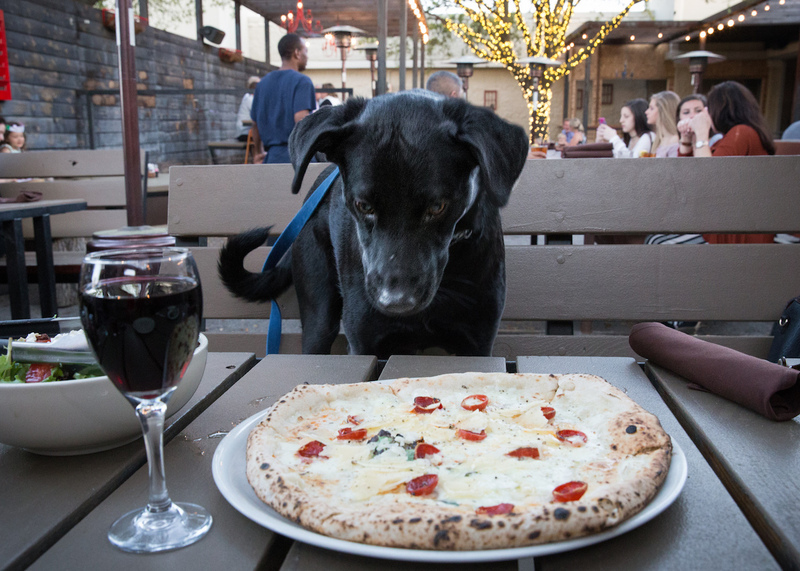 Cane Rosso, the Texas-based pizza chain that began in 2011, is just as passionate about dogs as it is about fresh ingredients and authentic thin-crust, Neapolitan-style pizza that is finished in custom-built wood-fired ovens from Italy that reach 900 degrees. Cane Rosso means “red dog” in Italian, in honor of owner and lifelong dog-lover Jay Jerrier’s first rescue dog, and the menu is full of references to the Cane Rosso clan’s pups. In 2014, Jay took his passion a step further by creating his very own rescue program, and 501©(3) charity Cane Rosso Rescue was born (it has since helped rescue more than 300 dogs). Their multiple locations also frequently host collaborative Pups on the Patio events, held in the spring and fall seasons, in which area rescue groups are given the opportunity to bring adoptable dogs to Cane Rosso’s dog-friendly patios for an evening of fundraising, pet adoptions, and pizza. Donations are accepted from patrons, in exchange for discounts and deals on food and drinks, and all donations are matched by Cane Rosso. They provide guests, including regulars Lazlo and Gigi, owned by frequent guest Susie Geissler, with a Cane Rosso-branded disposable water bowl (health department regulations don’t allow re-usable water bowls) and a supply of dog biscuits, and they also sell Cane Rosso Rescue T-shirts with all proceeds benefiting their rescue. Make a reservation at Cane Rosso. The spacious al fresco dining area at Del Frisco’s Grille comes with a backdrop of Rockefeller Center and the patio is bordered by lush greenery and features umbrellas to shade you and your furball when enjoying a leisurely meal. 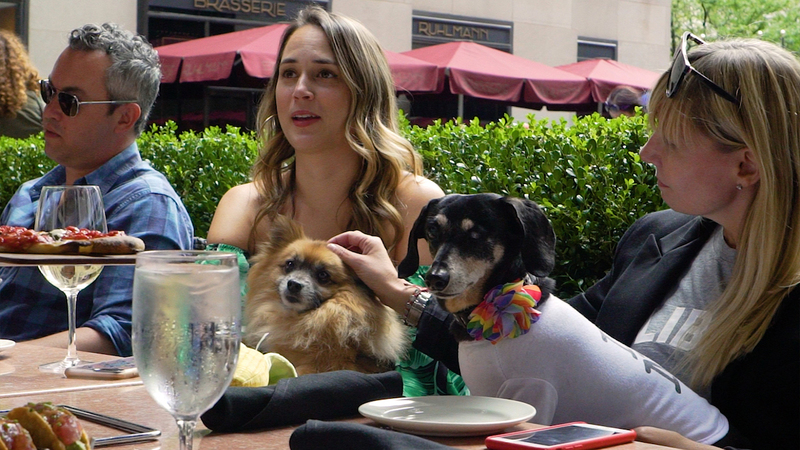 The restaurant just wrapped their Dog Days of Summer program that featured dog-inspired cocktails like the New Yorkie, and dog lover executive chef Greg Lombardi served up housemade dog treats. While that’s ended, you and your pup will still have a great time soaking up the scenery and partaking of their signature Ahi Tacos, the USDA Prime, double-stacked burger made from a custom blend of brisket, short rib, and chuck aged for 28 days, and The Grille Salad (because bacon!). Be sure to ask your server for a complimentary Del Frisco’s Grille Frisbee, which does double duty as a water dish while you’re there. Make a reservation at Del Frisco’s Grille. Housed inside the Kimpton Allegro Hotel, a pet-friendly hotel with zero pet fees, 312 Chicago in the Loop is an authentic Italian restaurant that caters to pups with a Waggin’ Weekends happy hour. Every Saturday and Sunday, from 11AM-2PM, they offer complimentary chef-made treats for your furry friend, available with any purchase. While guests enjoy a banging brunch or a light snack, hungry pups (and, honestly, aren’t they always?) can choose from the special Doggie Menu featuring $7 entrees that include Salmon & White Rice; Carrots, Celery, and Cheese; and Chicken and Pasta, as well as $4 treats (the Peanut Butter Biscuit or a Beefsicle). Up the anted for just $9 for an entrée and treat. Trust us when we say executive chef Luca Corazzina’s cuisine will have you both begging for more. Make a reservation at 312 Chicago. Since “Do you want to go for a ride?” is almost every pup’s favorite question, just slightly nosing out “Who’s a good boy?”, your pooch will be right at home at Radiator, designed with a nod to mid-century Washington, D.C., when 14th Street was lined with car dealerships and auto repair shops. Radiator’s tasteful automotive-inspired décor extends to the patio, which is always open to dogs. They take that hospitality to another level on special occasions, such as National Dog Day. To celebrate this year, their culinary team created unique dog treats, while their bartenders had a special dog-themed drink menu for the humans in attendance. 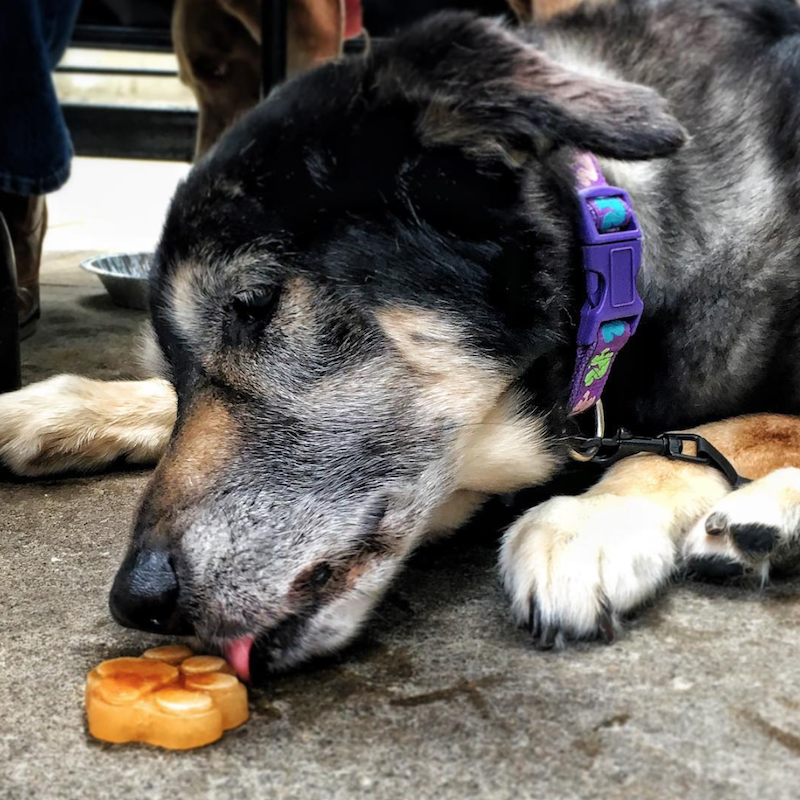 Plus, they partnered with City Dogs Rescue to bring dogs in need of a good home to the patio, and a portion of the day’s proceeds went to benefit City Dogs. Swing by to enjoy varied selections such as Kimchi Pickles, Hamachi Crudo, Sangria Watermelon, and Goat Cheese Angolloti. Make a reservation at Radiator. Take in the salt air at this waterfront spot located in San Diego’s iconic Gaslamp Quarter at the Manchester Hyatt. A recently expanded deck offers sweeping views of the San Diego Bay. 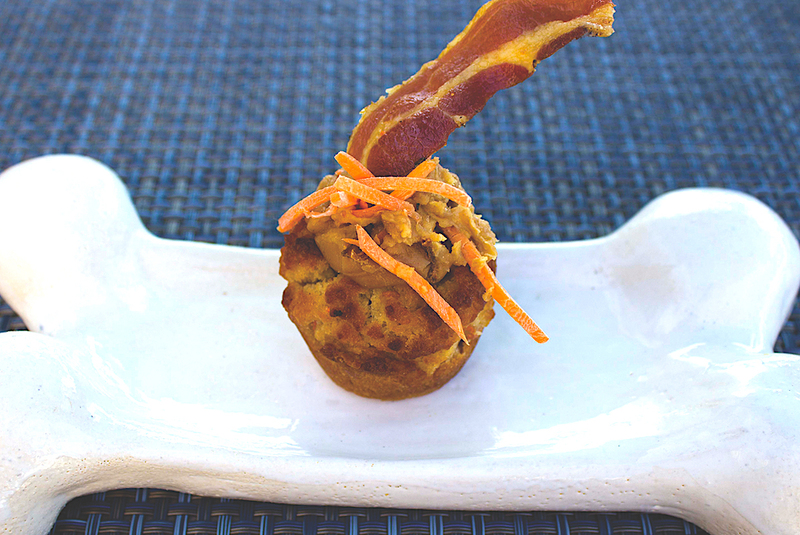 While you sup on offerings from the fresh, coastal-inspired menu, your faithful companion can partake of their dog-friendly menu, which includes snoot-smacking items, such as Sally’s Famous Pupcakes (pictured below), Chicken and Rice, Peanut Butter Cookies, rawhide bones, and more. There are also a quarterly Yappy Hour, featuring games, snacks, treats, and more. Plus, your pal can experience a true taste of San Diego’s booming craft beer culture with the Your Best Buzz Brew, a dog-friendly craft beer so you can cheer together. Make a reservation at Sally’s Fish House & Bar. At the recently renovated The Talbott, in the heart of ChiTown’s tony Gold Coast neighborhood, you’ll find 20 East. Think playful takes on modern American fare, like the Truffled Patty Melt and the Overstuffed French Dip, plus a cocktail menu featuring drinks like the Bees Knees with gin, honey, and lemon and the Lion’s Tail crafted with whiskey, allspice, lime, and bitters. The impressive patio, like the hotel itself, is pet-friendly, perfect for travelers who have their pal in tow. 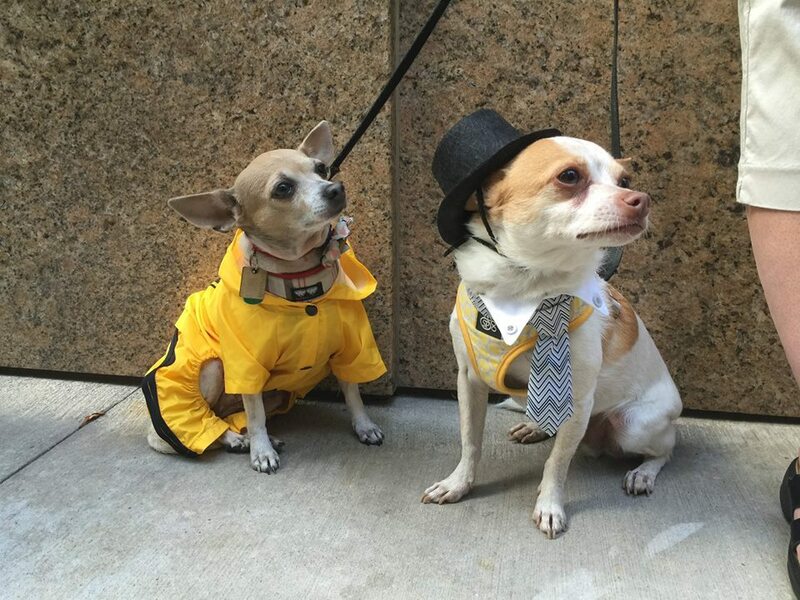 20 East also hosts an annual Doggy Fashion Show & Pet Adoption Event (pictured) to celebrate National Dog Day, which benefits the One Tail at a Time rescue organization. 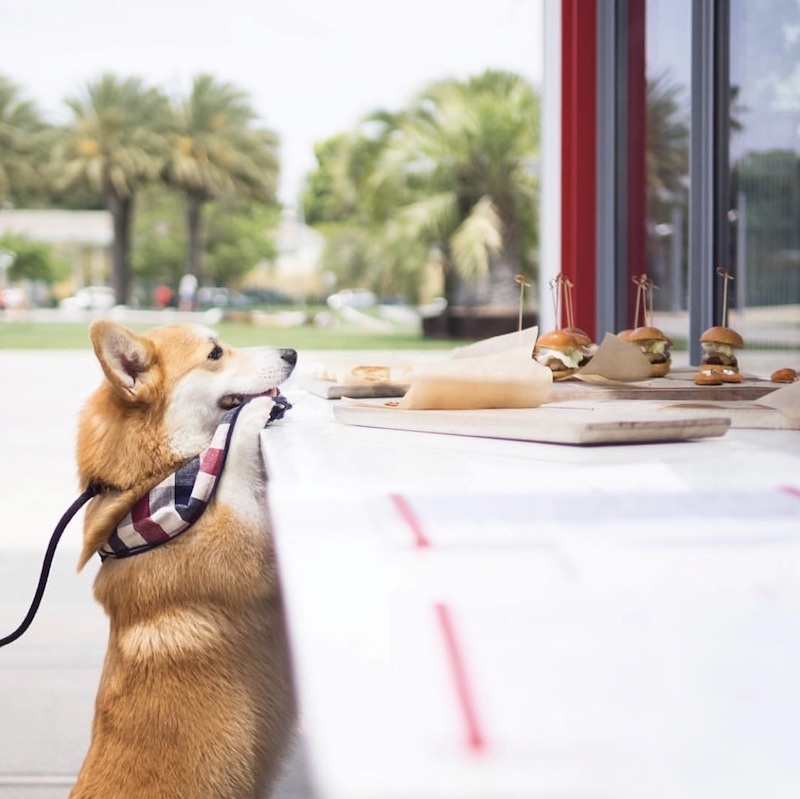 During the event, the restaurant also features a special canine-friendly menu in addition to the bites they normally serve to four-legged diners. Make a reservation at 20 East. Situated in the heart of the extremely pet-friendly city of Austin, The W Hotel, which is just a stone’s throw from the beloved Lady Bird Lake, hike and bike trails, and a dog park, goes above and beyond to cater to its pet-loving guests and furry friends. TRACE, the restaurant at W Austin, makes homemade doggie treats and doggie ice cream, and it has a lush outdoor patio for guests’ animals to enjoy, like regular Elvis, pictured here. This is all an extension of W Austin’s PAWS (Pets are Welcome) program, which ensures that pets are not only taken care of, but that they are also pampered. From providing litter boxes, grooming services, a specialized menu with Niman Ranch dog meals, and special treats at turn-down, pets are a fixture at the hotel. 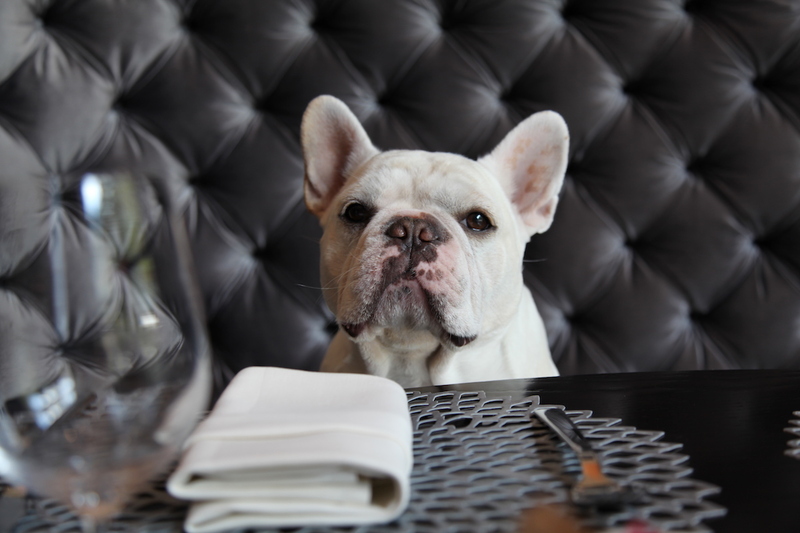 Make a reservation at TRACE at The W.
It’s National Dog Week: Let Us Know Where You’re Dining With Dogs! 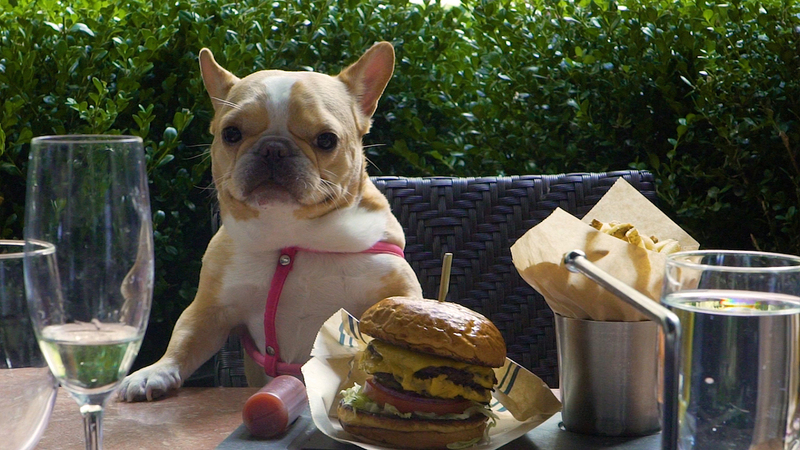 We’re celebrating National Dog Week by dining with dogs — and so should you! To kick things off, we’ve partnered with the folks at Bark to host a dog-friendly brunch at Del Frisco’s Grille in Manhattan. Beloved Instagram dogs were in attendance to try out the latest toys from BarkShop’s Lights! Camera! Bark! collection (think avo toast, froyo, and rosé), while their owners were able to sample executive chef (and rescue dog owner) Greg Lombardi’s delicious fare. 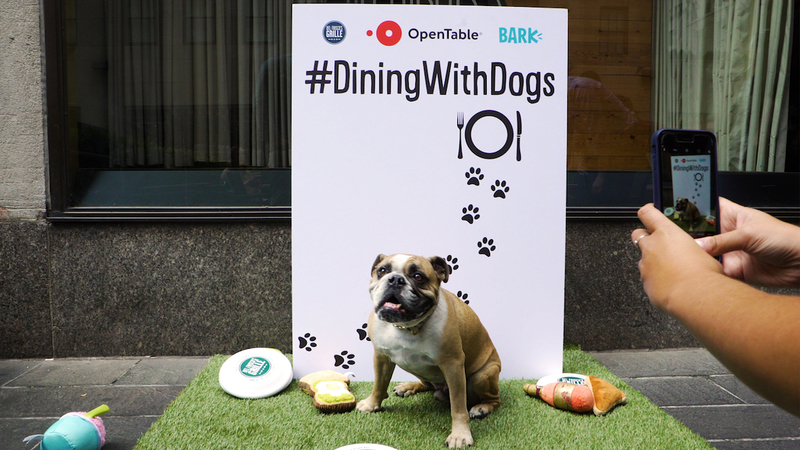 To join in on the fun and fete your faithful companion, follow and tag @OpenTable on Instagram and share a photo of your dog dining out using #DiningWithDogs for a chance to win a $100 Visa Gift Card and swag from Bark. Full terms and conditions after the jump. Tomorrow, we’ll share restaurants that really roll out the red (or green) carpet for doggie diners. And, we’re also making a donation to Houston Pets Alive to help dogs affected by Hurricane Harvey. To learn more about their efforts and to donate, visit //www.houstonpetsalive.org/.